Fully sealed aluminium or carbon rim profiles for road racing bikes are increasingly available on the market. They do not feature drill holes in the rim base. The manufacturers therefore negate the need for a rim strip. The problem here is that the heat generated by braking (rim brakes) penetrates directly through to the tire system. Carbon as rim material has the disadvantage of a lower heat conductivity. During braking, heat builds up and can unduly increase the thermal load on tubes and tires. Riding without a rim strip can result in sudden tire failure during extended braking, e.g. when riding down a mountain pass. In the right column you can download the warning notice. Please also observe our mounting instruction for carbon rims and tire-rim combination. How are bicycle tires mounted properly? Please have a look at the manuals for our different tire systems in our mediacenter and also observe the mounting instructions inside the tire packaging. For road bikes: In the right column you can download our warning notice for using Continental tires and tubes on carbon and aluminium clincher ""tubeless ready"" rims without rim strips. Please also observe our mounting instructions for carbon rims and for the recommended tire-rim combinations. Is there an instruction standard for aligning a tire? The sidewall of each tire indicates all the important information like dimensions, max. air pressure and the mounting direction. A tire running truly on a rim will have a consistent rotation. This can be checked by the user by looking for the horizontal line in the sidewall molding. If the tire is mounted correctly, the line has always the same distance to the rim. The displayed arrow should point into the rotation direction of the wheel (front vs rear on MTB). Some tires are developed to work equally well on both the front and the rear wheel. They do not have directional information on the sidewall and can be mounted in both directions (e.g. Mud King). Can I mount 28mm wide tires on my road bike? First it is important to establish which wheel rim internal size is suitable for which tire size. The ETRTO table on the right side provides an overview. Compatibility also depends on the frame size and the space constraints of the seat tube and the brake passage. For instance, it is possible that due it its diameter, a 28mm tire has too little clearance to the seat tube or even touches it. In addition, it should be noted that the height and width do not change proportionally. When is the use of CO2-cartridges recommended? CO2-cartridges should be used as sparingly as possible for environmental reasons. They are recommended for use in races when speed is required. In principle, you should always inflate tires conventionally. Therefore, only use the cartridges if you have a puncture on the road. Before screwing on the CO2 cartridge, ensure that the control valve is closed. Always use the enclosed neoprene cover because the cartridge becomes very cold when releasing pressure. Under normal pressure, the cartridge will be enough for up to two tire fillings. If you use sealant in MTB tires, you should not use CO2 cartridges. What is the Conti RevoSealant? The RevoSealant provides reliable sealing for punctures and small cuts without chemically corroding the tire or tube. The versatile RevoSealant is not only useful for repairs, but can also be used as a preventive measures for tubes and tubeless tires. With suitable tires, RevoSealant can also be used as a sealant for the Tubeless Ready systems which are popular on MTBs. RevoSealant, which is specially optimized for use in Continental cycle tires, can be used in temperatures as low as -20° Celsius. Caution: the sealing milk comprises a carrier fluid and granulate of different sizes. Therefore always shake the bottle well before use because otherwise only the carrier fluid will be filled, and this does not block any holes. What is the function of a rim strip? Small component = large impact. A poorly constructed or unsuitable tire rim tape can be the cause of many punctures. It is especially important with hollow section rims to use a pressure-resistant rim band which covers the entire rim. The fabric-reinforced Continental Easy Tape rim protector is designed for use under high pressure conditions. The various widths enable a perfect fit for all standard rims. 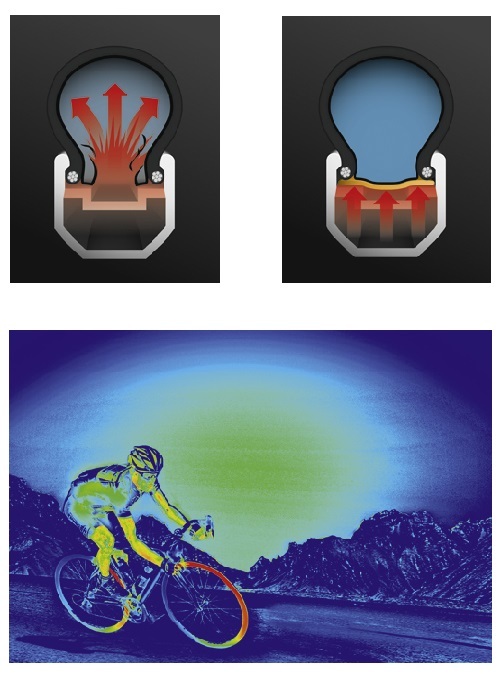 The high pressure design for racing cyclists withstands up to 220 PSI, without becoming deformed. The flat construction type also significantly eases the job of tire fitting. Continental recommends the use of Easy Tape rim strips with any rim and especially with sealed rims because it protects the rim from direct heat (see also: warning notice ).